he quick easy way to determine sample sizes and allowable defects. With the increasing reliance on AQL inspection by attributes, a variety of people from Quality Assurance Engineers to Inspectors with minimum technical training using sampling plans based on the AQL standards: MIL-STD-105E, ANSI/ASQ Z1.4-2003 (R2013) or ISO 2859-1 (1999). 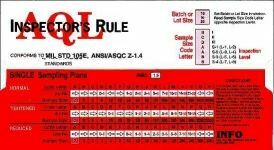 The AQL Inspector's Rule is designed to provide this information in an easy to use format. Its growing popularity since it was first introduced in 1968 indicates it value. The AQL Inspector's Rule's straight forward design saves times and reduces confusion. All the data is conveniently grouped so that the sampling plan can be read off instantly. The rule covers a wide range of AQL's (.065 to 15) with Normal, Tightened and Reduced inspection for both single and double sampling plans. It rigidly adheres to three inspection standards: MIL-STD-105E, ANSI/ASQC Z1.4-1993, ANSI/ASQ Z1.4-2003, ANSI/ASQ Z1.4-2008 and ISO 2859-1 (1999). The AQL Inspector's Rule is based on inspection by attributes for use in sampling inspection, measuring, examination, testing or otherwise comparing the unit of production with specified requirements of continuous series of lots or batches. AQL sampling plans are used for, but not limited to, the following: Components, raw materials, end items, operations, materials in process, supplies in storage, maintenance operations, data or records and administrative procedures. 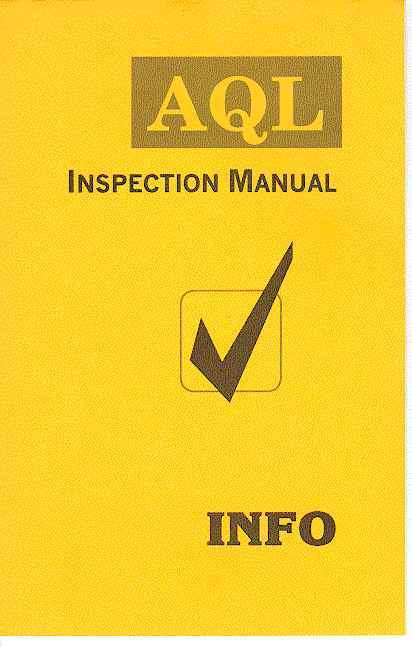 An AQL Inspection Manual comes with each AQL Inspector's Rule with information on AQL sampling and instructions on use of the rule and dictionary or terms. Besides being a time saving tool on the job, the AQL Inspector's Rule, combined with the manual makes a valuable training aid.